Mainly clear skies. Low 36F. Winds N at 10 to 15 mph.. Mainly clear skies. Low 36F. Winds N at 10 to 15 mph. The Hoosac Tunnel in western Massachusetts, the longest active transportation tunnel east of the Rocky Mountains and the sixth longest railroad tunnel in North America, remains a landmark in hard-rock excavation. Over the course of its construction, back in the 1860s, virtually every kind of tunnel digging device was used to bore through Hoosac Mountain and virtually every kind of mistake was made during its process. Thanks to these painstaking lessons learned, however, miners today can burrow longer and safer shafts in a fraction of the time. The project was originally proposed in 1819 as a shortcut to connect the city of Boston with markets in upstate New York, especially those in the Albany tri-city area. Up until this point goods were floated down the Deerfield River east of the Berkshires, lugged over a 2,000-foot hill and moved west via the Hoosac River, which connected 73 miles later to the Hudson. The project was shelved several times but finally reborn as part of the new Troy and Greenfield Railroad. On March 16, 1853, work began at an estimated cost of $2 million on the five-mile passageway and ended just as quickly. 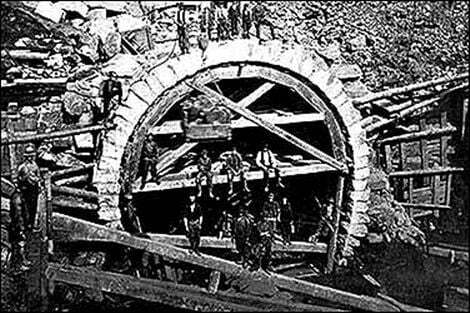 One of the earliest tunnel boring machines, “Wilson’s Patented Stone-Cutting Machine” was used and promptly quit after excavating only 10 feet into the Hoosac, never to run again. It remained jammed in its hole for many years as a bleak symbol of engineering failure. When construction finally resumed workers relied on nitrate-based gunpowder to blast through the mountain. Progress was slow as each discharge produced only a few feet of shattered rock that had to be cleared out by hand and animal power. In all, the tunnel construction project required excavation of over two million tons of rock and continued on for the duration of the Civil War. By 1866, two new innovations were introduced: large scale blasting by nitroglycerin and the compressed air drill, both used for the first time in the United States. Workers moved faster than ever before, but not without risk. At that time nitroglycerine was a new and unpredictable explosive and terrible accidents were commonplace. One notable calamity occurred during the digging of the Central Shaft in 1870. This one-thousand foot vertical hole located directly in the middle of the mountain was designed to both ventilate and offer another two locations for horizontal digging. When the shaft was completed, the reasoning went, additional workers could now dig outwards to join up with the tunnels being worked on from the east and west portals. Unfortunately on October 17, 1867, while workers were digging the downward shaft a candle in the upper hoist building ignited naphtha fumes that had leaked from a “Gasometer” lamp. The resulting explosion at topside set the hoist on fire, allowing the building to collapse down into the shaft. Thirteen men working at the 538-foot level were trapped by falling naphtha, pieces of wood and iron raining down on them. Because the drainage pumps were also destroyed in the process, the shaft began to fill up with water as well. Work was halted for several months on the project until better safeguards were put in place. In all, the tunnel accounted for 196 fatalities, many due to black powder explosions at the beginning and just plain carelessness. To insure that the tunnel stayed on a correct course, a system of alignment towers over the crest of the mountain was established. Each tower housed a transit scope that allowed the survey crew to verify the true path during the progress. On December 12, 1872, workers opened the east portal tunnel to the Central Shaft and found they were aligned to within 9⁄16 inch — a tremendous engineering achievement at that time. One year later the remainder of the tunnel was opened to the west entrance. It was a 20-year project. The first train passed through the 4.75-mile tunnel on February 9, 1875. By 1910, the tunnel was electrified with the goal of reducing smoke and increasing the speed of traffic. Three years later, traffic within the tunnel was so heavy — at 70,000 cars on average a month — that the power plant in Adams, with its 6-megawatt generator, could not keep up with the drain and another electrical plant was setup. Because it was such a key location for rail traffic heading east and west, the tunnel was placed under U.S. Army guard after the United States entered World War I. By 1946 a large exhaust fan was installed above the Central Shaft to remove diesel exhaust fumes. Clearances were increased in 1997 and again in 2007 to allow double-stacked container trains to pass through. During its construction, many tunnel diggers claimed to have been haunted by the ghosts of two workers who died in an unexpected blast. Even today, there are many reports of ghostly activity in the Hoosac Tunnel that no one can explain. Gary Hanington is Professor Emeritus of physical science at Great Basin College and chief scientist at AHV. He can be reached at garyh@ahv.com or gary.hanington@gbcnv.edu. What is the maximum number of pieces you can cut a glazed donut into by making only three straight cuts? It is way more than eight.